You’ve got to love how the internet works, a couple of days ago Tom Aderson (aka @myspacetom) decided to let the world know about his thoughts about the new Instagram terms and conditions. In case you don’t know who Tom Anderson is, he’s a US internet entrepreneur who co-founded the social networking website Myspace in 2003. Ofcourse, people always have something to say and someone decided to reply to him with what might have sounded like a clever response, right? Not too sure, because myspacetom really burnt the guy and put him in his place. 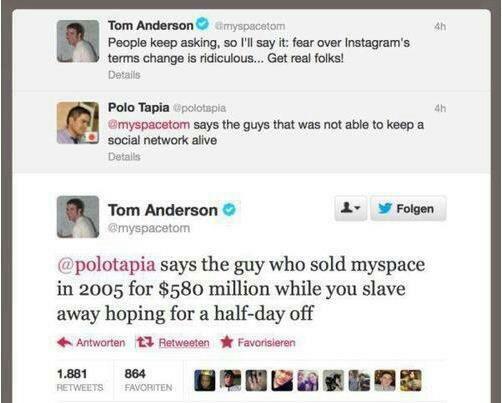 I’m not sure what @polotapia was thinking, but if I was him I definitely wouldn’t have had replied to him like that, because even though myspace isn’t doing to well now it was quite a success for a couple of years and Tom did manage to make a nice dollar on it. I would understand if @polotapia was another entrepreneur that has had a major success like myspace, but other than that really his comment was ridiculous. Here’s another reply @myspacetom left to another fellow tweep, when they commented on his profile pic that he’s been using for the past 10 years.